Abandoned and Vacationed maps. The final resting place, unless you recycle. I like the new font. It's easier to read and seems to go better with the theme of the map than the previous font did. Do you have any plans for the bridges? Are you going to do something else with them, or leave them as is? Did you have any ideas on the 1v1 vs. every other type of gameplay idea that nolefan had above? tkr4lf wrote: Looking good, gh! Thanks bud, The bridges do need some work; I will try a few things for the next draft. I definitely agree with the 1v1 drop. I believe that all gets work out in the coding of the drop correct. Do you think that it needs to be represented on the map somewhere? I think with other maps the drops usually aren't installed in the legend. Yeah, you're probably right about that, just a matter of coding the drops, so shouldn't need to be displayed on the map. So, what else is going on with it? so like for instance I would make Ortega able to bombard all of King crawford and winchester maybe? Not just one of them. or is it just allow bombarding one because that is how youd stop the bonus? I just feel if it has such a large nuetral, that it should be able to bombard more. The way it reads now, "Bombards entire region of the same color" makes me think that ortega would bomb, Gonzalez, Barro, Duque, Diaz, and King. and that is all, am I reading that correctly? swimmerdude99 wrote: Personally something in the way of clarification needs to be done in the legend or on the map colors to make them more pronounce, where is the hopsital? where is the Chapel? Are they one territ or a bonus? They are shown by the color glow around the names. 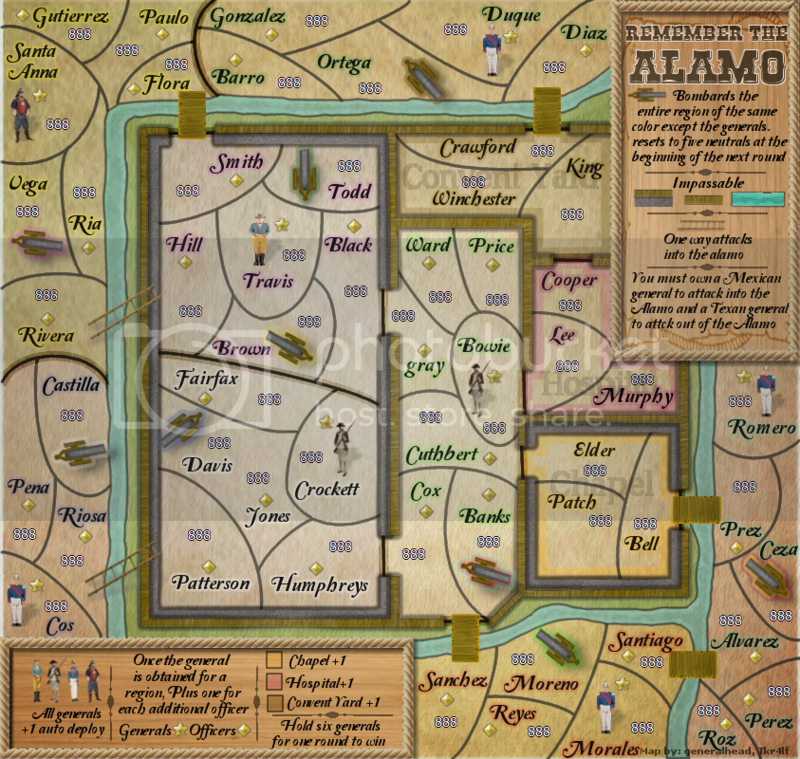 See the colored boxes in the legend next to the names Hospital, etc.? So, Hospital is Cooper, Lee, Murphy. Convent Yard is King, Crawford, Winchester. Chapel is Elder, Patch, Bell. Apparently they need to be shown in a clearer manner. Perhaps a more pronounced glow? Or something else? The way it works is that each cannon bombs the entire region (except the commander) in which the same colored target is located. So Ortega would bombard Crawford, King and Winchester. Todd would bombard Diaz, Ortega, Gonzalez and Barro. Vega would bombard Smith, Todd, Black, Hill and Brown. Etc., etc. Apparently this needs to be clarified better, or simply worded differently in the legend to make it clearer. Do have any ideas on how to do that, swimmer? I am not going to do a quote because that would be long. Swimmerdude I appreciate you looking at all of this it is great to get a new set of eyes on the map. 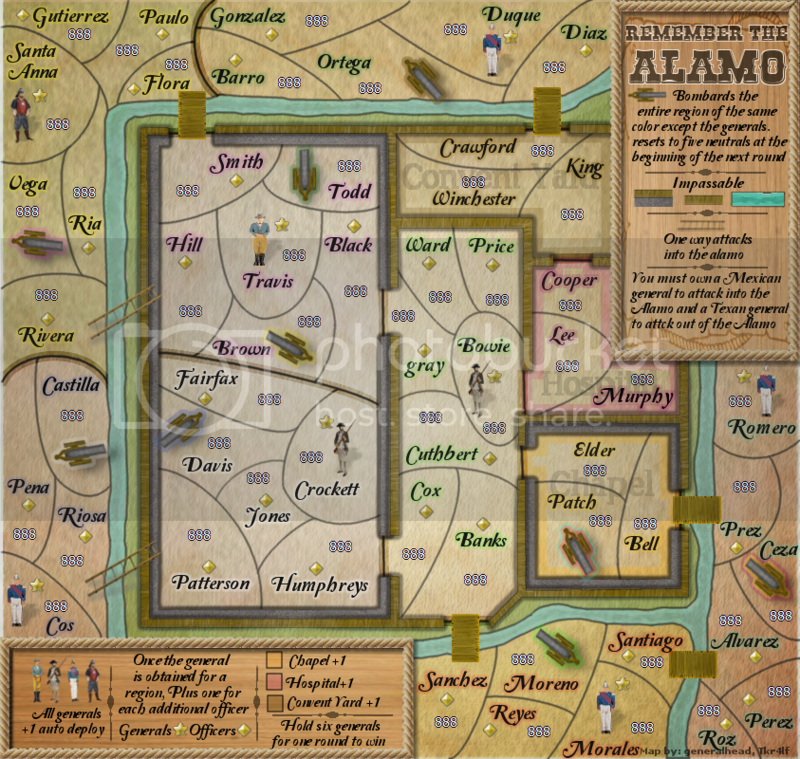 In the legend it says the cannons bombard the entire region of the same color (and then there is a target symbol). I might have to bung that out more. they are the only bonus regions. The cannons target is something I have been thinking about It is odd to have one little target to show that the cannon can bombard the entire region. It might be too much for the eyes to have a target on every territory that the cannon can bombard. If any one has any suggestions on how to show where the cannons will bombard with out it being too much on the eyes I am open for advice. Thanks for the replies guys, and yes I do have ideas on how to show the bombarding area better then. Why don't you have the cannon be the color of the BOMBARDED area, signifying WHERE it bombards. generalhead wrote: Great suggestions swimmerdude. Also, have you guys considered having bonuses for each area inside the alamo, not just the few rooms? if you have and decided against it, what is your reasoning behind it? Not saying its wrong, just wondering why there isn't any! the legend says hold six officers for one round to win, this should say generals. great map by the way, i look in from time to time and it has come a long way. looking forward to playing this one. Thank you nicarus. I will fix that in the next draft, good eyes bud. Last edited by generalhead on Sun Dec 23, 2012 1:24 pm, edited 1 time in total. Thank you for doing so, the more eyes on this the better it will be in the end. We opted to due the general/ officer bonus over the region bonus. The general officer bonus makes the map a little more realistic than just having a region bonus. The bonus's would probably be too high to try and incorporate both. because in one small region would then give you a bonus of 6. Texan army so we wanted more Mexican generals and officers than Texan generals and officers. That is the reason why we opted for regular bonus's there. Looks like you're doing lots of good work here, generalhead. I didn't get through the whole thread, so it may have been discussed already, but perhaps there could be a different symbol for the officers vs the generals. The generals could be a single star and the other officers maybe crossed swords? I guess a little historical research might turn up something appropriate. Or you could just copy the CC scheme. jonofperu wrote: Looks like you're doing lots of good work here, generalhead. Hello jonofperu. Thanks for checking out my map. I still need to do the lines like Koontz mentioned, I just wanted to get this posted so the changes can be commented on. generalhead wrote: I still need to do the lines like Koontz mentioned, I just wanted to get this posted so the changes can be commented on. Maybe its just me, so input would be recomended of course, but I LOVE the way it looks now. Question on the one cannon, it looks like it can bombard the pink and the green, is that correct? and Morales since it is a smaller region. tk what do you think? tk do you like the insignia better too or should I try something different. I think it's pretty clear the way it is now with the cannons. It's fairly clear that Patch attacks both Romero and Morales. It is kind of hard to tell that Ceza can attack both the hospital and the chapel though, so maybe some work clarifying that would be good. The colors for the hospital and chapel are pretty similar though, so it might be kind of hard to do it. Maybe slightly changing one of the colors would be good. As for the insignia, I like it. I especially like the general icon, the captain/officer one is ok too. just a thought, could you import the general star cc uses for its general ranking, it has more defined lines where the one you made seems to have no definition. the diamond for the officers looks good. In order to bring in the chapel bonus do you have to hold Patch? if so I doubt that bonus will ever be used, kill 5 nuetrals for a 1+? How about if I move the cannon to Banks and move the border line so Cox goes to the bridge and not Banks? I will try this for the next draft.